Can board training be interesting? What a question! The mere fact that you’re asking says that you’ve had bad experience with consultants coming in and telling everyone what they ‘should’ be doing. That is such a wrong approach, it’s no wonder board training has such a bad rap. Even the word ‘training’ is demeaning. It sounds like you’re training animals in a zoo or a circus. get them to figure it out for themselves. As with anything else, start with the end in mind. Then you can reverse engineer to find the steps that will lead you there. You say you need board education. Why? What’s the end result of board education? It’s not having board members know their roles. That’s only a stepping stone. Board members knowing their role is a means to having a thriving organization. If you want board members to know and be invested in their role, engage them in a robust conversation around what you need to have a THRIVING ORGANIZATION. not a thriving board. The board has a role to play in each of them. The first is the future orientation – the long view. Board members have a responsibility to watch the world and consider how it will impact the organization. The second is finding the resources – fundraising, relationships, hiring the executive, ensuring the talent is there. Board members have a responsibility to make sure the organization has what it needs to fulfill the mission, whether it’s treasure or talent. The third is oversight and evaluation – are we being careful with the resources, are we following the law, are our programs the best way of fulfilling our mission. Board members have the responsibility to ensure that the organization is putting its resources where they’ll do the most good, and not jeopardizing the mission with poor or illegal practices. Once you have these established, the next step is for the group to generate the HOW. How will you make sure you have a future orientation? What will it take to generate the different kinds of resources? What will make it possible to ensure that resources are wisely used, and we’re following the law? In the conversation, you may suggest some recommended practices. It’s at this point you can tell the board members that they, themselves, have come up with what their roles and responsibilities are. You can present the usual checklist of responsibilities and show them that they’ve generated most of them themselves. Board education doesn’t have to be deadly – or demeaning. A retreat to engage your board members in the whys and wherefores of a board makes the role of board member meaningful, and uses their passion to generate their own individual roles. An external facilitator can often make this retreat flow more easily. Let me know if you want to explore that possibility. To learn more about nonprofit boards and facilitation, you can follow me at The Detwiler Group. This post is just as true now as it was when it was originally published in 2014. Let me know how YOU’RE thanking your board! Where there is no gratitude, there is no meaningful movement; human affairs become rocky, painful, coldly indifferent, unpleasant, and finally break off altogether. The social ‘machinery’ grinds along and soon seizes up. Thanksgiving is an obvious time to write about being thankful, and it’s nice to have a time to stop and consider all that we have to be grateful for. We think about our friends, our family, our health. It’s also not a bad time to stop and contemplate how awesome your board is, and how much they’ve contributed to the well being of your organization. When was the last time you thanked your board members? They’re each making your agency a priority in their lives, giving work, wealth, wisdom and wit. They could be giving it somewhere else; they could also NOT be giving. But there they are, week after week, month after month, making difficult decisions, acting as cheerleaders, supporting your work, being ambassadors for your agency. Each board member is the equivalent of a major donor. Whether or not the dollars are substantial, she has the capacity to make your life easier, introduce you to supporters, provoke new ideas, stabilize a situation. She should be told how much she means to you. If you’re the Executive Director, the next time you write a thank you note to a donor, also write one to a board member. Do that until you’ve written one to every member of your board. If you’re the board president, sit down and hand write a thank you note to each board member. If you can, name a specific action for which you are grateful. Do you want to cultivate an attitude of gratitude within the board? At each meeting, assign one or two board members to offer a very brief statement of gratitude around the organization. It might be why they are grateful the organization exists. It might be what they appreciate about a staff member. It might be what committee they are particularly grateful to. In many faith traditions, there is the concept “do not withhold the wages of the laborer.” It’s obvious how that applies to staff, but the wages of a volunteer are less obvious. The wages of a volunteer – the wages of your board members – are the thanks she receives for her work. The psychology of gratitude and its benefits are being researched throughout the fields of education, and migrating to the business world. 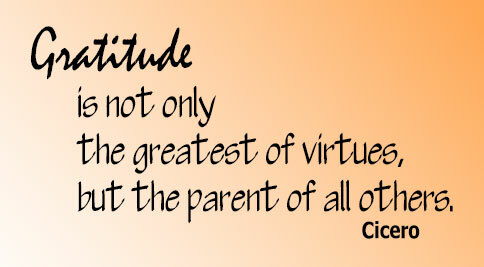 Some readings on gratitude can be found at gratefulness.org. Professional Development is for Staff, Not Boards. Imagine you have an ailment that takes you to the doctor. On the wall is her diploma from 20 years ago. “Ah!” you think. “She has a lot of experience. Hmm, I wonder if she’s kept up with the latest thinking in caring for my ailment.” In 20 years, there have been ag lot of medical advances. Keeping up in your field is important. Companies invest in training and development for their managers and staff. Bar associations require Continuing Legal Education credits; American Medical Association requires Continuing Medical Education; school systems require Continuing Education credits for teachers. With so many examples of professions requiring continuing education, why do board members say they don’t need to keep up with trends in board service? I already know what I’m doing! Underlying all of these is a basic misunderstanding. They believe board service is simple, static, and hasn’t changed in 20 years; there’s nothing new to learn. Even if there is something new, it’s not going to make a difference. Actually, the field of board service is changing. The fields of sociology, organizational dynamics and neuroscience have upended some longstanding ‘best practices’ and received wisdom. Organizations that put the new ideas into practice are more successful than those that do not. Last year, I gave a series of seminars around board relations and governance. As I set the curriculum for this year’s cohort of attendees, I’ve been spending almost as much time updating the materials as I did creating it in the first place. Articles from Nonprofit Quarterly; BoardSource; Standards for Excellence; Harvard Business Review and more have supplied fodder for high level discussion around governance and building a board into a team. In many cases, the new research have been a complete surprise; in others, they’ve demonstrated nuance where absolutes have reigned. The bottom line is that these discoveries have made board service richer, more robust, more enjoyable, and, perhaps most importantly, more effective. Boards with contemporary training spend less time on the past and more time focused on the future. Boards built into teams spend less time infighting, and more time figuring out how to better deliver their mission. Boards with good relationships amongst members have rich discussions around substantive issues. Boards that have developed an inclusive mentality have the advantage of diverse viewpoints and experiences around the table, with all the creativity that inspires. All of these have been the result of continuous professional board education. And their organizations are stronger for it. Get in touch for a conversation about board education and how facilitating professional board development can make your work easier. Or sign-up here for more ideas about managing boards and planning. Are your collaborations spinning wheels? Everyone talks about collaboration, but when collaboration fails, do we really analyze what happened? Or do we pretend we’re analyzing what happened, but are actually assigning blame? I love this article. In this 2014 Harvard Business Review article by Nick Tasler, he points out two simple explanations for how things go wrong. Simple, of course, once you hear them. First – do you all agree on what you’re trying to do? You may think you all know what you’re collaborating for, but have you really stated it explicitly? I’ll take it further. Have you defined what success looks like? You may be saying, “we need to fix the student problem,” and everyone will nod and get to work. But what does a ‘fixed student problem’ look like? Unless you all agree on what it looks like, then you won’t be able to make decisions between multiple alternatives. Second – how are you going to make a final decision? Tasler’s article puts it in terms of who will make the decision, but the more universal way of looking at is how will you make a decision. With multiple collaborators, you need to decide that up front, before you get into the weeds. To answer these two basic questions, your group may need an external person to guide the conversation – someone from another department, another organization, or a professional facilitator. You want to make sure everyone is heard and there’s a final agreement. Nick Tasler wrote from the perspective of multiple teams in the same corporation. But what he says is valid within nonprofits, as well. And all the more so when you’re talking about collaborating with other organizations. Be explicit about what you’re collaborating about. Agree on how final decisions will be made. Until you have both of those, expect a lot of time spent spinning wheels. Interested in hearing how a facilitator can help smooth the way? Send me a note and we can have a conversation. Do you have a board profile matrix? Good! Now throw it out. Harsh? Maybe. Necessary? You decide. Where did you get that matrix? Was it found somewhere in a template? Maybe it came from someone else’s board; it looked good, so you adopted it. Maybe it’s a legacy matrix that has been handed down for the last 10 years by the Governance Committee (or Executive Committee, or Nominating Committee). If you didn’t develop that matrix AFTER you decided what you want to be doing in the next 5 years, there’s a chance your board won’t match your ambitions. First, decide what you’re doing. Then figure out what passions, skills, attributes, connections, experiences need to be present on your board to make it possible to do it. THEN evaluate your current board against those attributes. Otherwise, you may be using five year old hardware to run state-of-the-art software. And we know how well that works. Planning your future includes planning what you need to create that future. Let me know if you want to talk about planning. Happy to have that conversation, or facilitate your group discussing its future. Weak Ties, Strong Boards, and Finding Resources - The Detwiler Group on Will your Nonprofit be Here in 30 Years? Weak Ties, Strong Boards, and Finding Resources - The Detwiler Group on Exclusive Interview: How They Did It! Susan Detwiler on Asking for help…or opening possibilities?